But while we hear about it a lot, many people aren’t quite sure what it means, or what their role is in supporting it. We clear up that confusion and consider the three different aspects of sustainable development, as well as how they fit together. In preserving tomorrow’s environment, many policies do inhibit the economic growth of poor countries and developing countries. In boosting developing economies to the point where they have room to think about environmental and social values, the temptation to ignore them for the present is strong. In setting boundaries on use of resources, the upshot is often that richer economies – who have already leveraged those resources – end up denying poorer economies the same option. As you can see, there are a lot of potential factors to think through. The Sustainable Development Commission got it right when they used the word “balance.” But, that balance may not come in the form you think. Before we consider that, though, let’s break sustainability down into its three main prongs. Temarry's closed-loop recycling process offers a truly sustainable approach to recycling. There are three major trends that are shining a light on the concept of sustainable development and the need for action. The world’s population is growing…...exponentially. There is a finite supply of non-renewable natural resources available. There is upwards pricing pressure on non-renewable commodities that will have an economic and social impact long term. These trends were of such concern that in 2015, all United Nations Member States adopted The 2030 Agenda for Sustainable Development. This agenda includes 17 Sustainable Development Goals (SDGs), that are an urgent call for action by all countries - developed and developing - to act in global partnership. In the past, development was typically driven by one particular need, without fully considering the wider or future impacts. We have already seen the damage this kind of approach can cause...large oil spills, dwindling natural resources, changes in global climate and health crises from waste dumping. The longer we pursue unsustainable development, the more frequent and severe its consequences are likely to become, which is why we need to take action now. The term “sustainable development” immediately conjures to mind images of “do-gooder” environmental processes. However, while the environment is one critical target of sustainable development, it is only one. If we want the world to flourish in the future, we must consider all three aspects. Economic: Sustainable economic growth is that which neither strips resources from the surrounding areas nor relies on a boom-and-bust mentality, creating economics that wouldn’t therefore stick around long enough for future generations to benefit. Social: Though it gets less attention than the other two, sustainable social growth means processes that lead to healthy and livable communities, where human and animal life is respected, and in which diversity, connectedness and democracy are all supported. Environmental: As the best-known of the sustainability models, you may already know that sustainable environmental development means that which stewards the Earth’s natural resources, steadily removes species from endangered watch lists, replaces resources as we use them and respects the sovereignty of non-human species, whether we rely on them for our own needs or not. We must also consider how these three areas relate to one another. While it’s tempting to assume all three must balance, with equal weight placed on each, that’s not actually the best approach. In other words, if you don’t start with an environmental approach that the Earth is capable of supporting, your sustainability will prove short-lived. When we strip regions and countries of their resources, they fall into disarray socially and economically. We must do our best to steward all regions of the Earth environmentally, and then turn our attention to economic and social sustainability and justice. That’s why Temarry puts such a strong focus on environmental sustainability. What exactly are we doing to maintain the ecological integrity of our world? We believe wholeheartedly in sustainable development. While sustainability manifests in a myriad forms – from crop rotation to green space, sustainable design and construction to water conservation – our specialty is waste-to-energy recycling. We understand that valuable natural resources like fossil fuels and water are finite and diminishing. Investing in waste-to-energy has allowed us to preserve valuable fossil fuel. 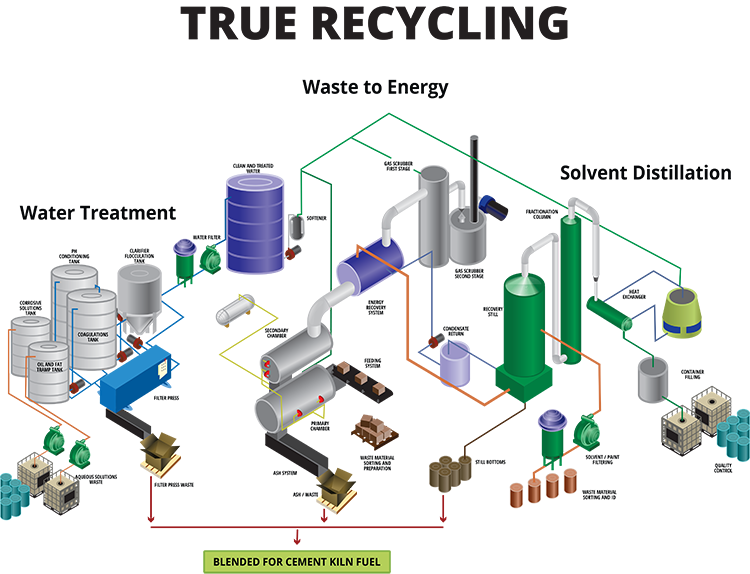 Our process generates energy -- electricity and/or steam -- from the combustion of non-recyclable hazardous waste solids (rags, organic debris, PPE, and absorbents) earmarked for the landfill. Temarry’s approach to waste-to-energy provides a good example of sustainable development within a company. At Temarry, all waste is recycled, and nothing goes to landfill. Liquids are filtered and blended, and then directed to a solvent recovery still. Solid waste is thermally treated at 1500°F to generate steam. That steam is used as an energy source to power those stills, reducing our dependence on valuable natural resources such as propane and water. The stills produce technical grade solvent products that are sold back to industry. Everything is used and nothing is wasted. Click here to learn about our Recycling Services. Water is another natural resource that has largely been considered a free raw material and therefore used inefficiently, but many companies including Temarry are now experiencing the higher costs of using the resource. As the earth’s population grows, the demands on our water supplies and upward pricing pressure will inevitably increase costs. Our water treatment facility allows us to take in water-based acids, bases, oily water and other water based industrial wastes, and convert these hazardous waste streams into clean water to serve all of our industrial water needs at our location. We are now able to save 300,000 gallons of purchased water annually by recycling contaminated water-based waste from our neighbors, saving them from the landfill and useless discharge after treatment. Focusing on sustainable development has not only improved our processes and do our part in contributing to sustainability, but it also allows us to help our customers by providing recycling services that allows them to also contribute to the sustainability effort.